Well it only took me three months to get around to it but the 1922 George B. 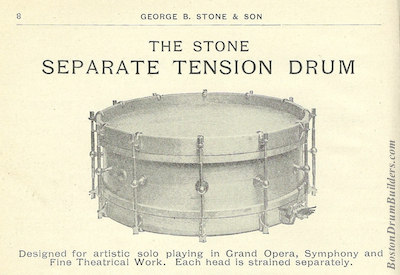 Stone & Son Separate Tension Orchestra Drum is all finished. The drum was quite dirty on arrival but cleaned up quite nicely. The third pair of pics below provides a glimpse of the before and after. The shell label inside the drum bears a very clean date stamp reading 5 FEB 1922, or February 5th, 1922. 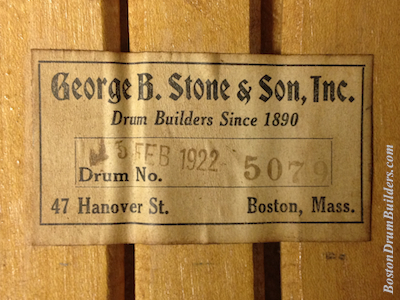 Stone & Son was in their prime in the mid - early 1920s and this drum is an excellent example from that period. 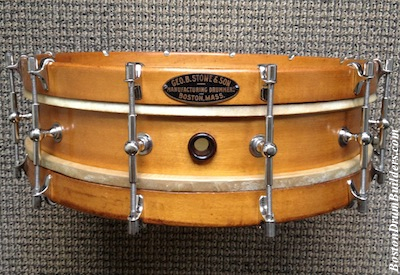 The polished rosewood grommet and pre-"INC" badge are both consistent with George Stone drums produced through about mid-1922. The move to badges with the "George B. Stone & Son INC" lettering occurred at some point mid way through that year. Threaded black Bakelite grommets began appearing in place of rosewood grommets sometime in 1924. 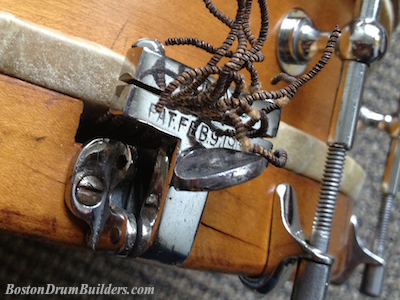 The only major structural flaw on this drum is the missing arm for the Stone / McIntosh snare throw-off. This is a common issue. Maybe a correct replacement will come along one of these days. Also, there is a crack in the bottom hoop where the strainer is attached, but so long as the snares aren't tensioned too tightly, at least the problem won't worsen. 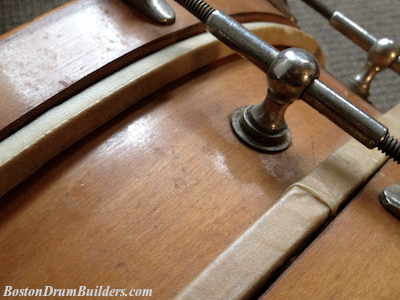 After cleaning, the drum came back together without too much hassle. 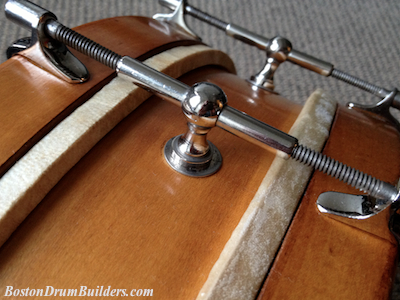 The original snares and batter side head were re-installed, and a new bottom head (a repurposed Kalfo Timpani head in fact) was tucked on the existing flesh hoop. The new bottom head is admittedly too thick for perfect authenticity, but for display purposes it fits the bill.